These tests are designed to help the overall improvement of the Vizsla breed, showing the versatility of the Vizsla as a good looking, well mannered hunting dog. Altered or intact, AKC or ILP registered dogs are eligible for this award. 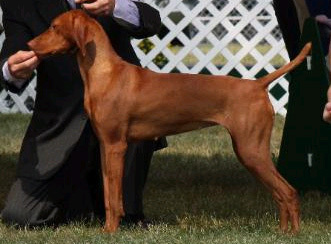 The Vizsla Club of America will designate dogs completing the requirements as Versatile Champions (VC). The letters VC will follow your dogs’ registered name. The VC designation is a VCA award and is not recognized by the AKC however, the title may be included in advertising. The VC designation obtained by progeny is worth 3 points towards the calculation of the sire and dam’s Registry of Merit qualifications. Once a year, a list of all new VC’s will be published in the Vizsla Club of America’s Vizsla News. If you are signed up for Versatility at a TBVC event you must print, complete and bring the Versatility Test Entry Form to the event with you. TBVC offers Versatility Testing at the following events: Summer Fun Weekend, Fall Hunt Test, December Field Trial, February Field Trial, March Hunt Test and Spring Field Trial. Each test is offered each day of the event. That makes 12 opportunities to earn legs each year! If you have any questions about the VCA Versatility Program, please contact Vicki McArthur, TBVC Versatility Chair at vmcarthur@nullfsu.edu. 1. Enter Conformation Versatility and pass 3 times under 3 different Judges. Please see Conformation Overview & Rules, and Conformation Score Sheet for more details. 2. Complete the minimum Conformation requirements as listed in the Versatility Test Rules and complete and submit the Application for Versatility Certificate to the VCA Versatility Chair. 1. Enter Obedience Versatility and pass 3 times under 3 different Judges. Please see Obedience Overview & Rules, Obedience Judge’s Commands and Obedience Score Sheet for more details. 2. Complete the minimum Obedience requirements as listed in the Versatility Test Rules and complete and submit the Application for Versatility Certificate to the VCA Versatility Chair. 1. Enter Field Versatility and pass 3 times under 3 different Judges. Please see Field Overview & Rules and Field Score Sheet for more info. 2. Complete the minimum Field requirements as listed in the Versatility Test Rules and complete and submit the Application for Versatility Certificate to the VCA Versatility Chair.